Another long day has finally come to an end. You lay your head on the pillow and think, “Today was such an amazing day. I have such a perfect life!”. What? Not your average day? Maybe you can’t remember the last time you had that thought. Some of you believe your life is so far from perfect that you’ll never see perfection in your lifetime. But maybe I can help you see it a little differently. Now THAT is reachable perfection, even in our earthly lives! For we have a perfect example to follow and emulate. When Jesus Christ left a perfect Heaven and came to earth to live as a man He faced stuggles just like ours and never sinned. As we faithfully follow Jesus we also become perfect. When we allow Christ to work through us we have His promise that we are perfect. In His eyes we are already perfect as we trust in Him and allow Him to make us holy. The perfection God promises us doesn’t mean that every day will be a great day by earthly standards. The perfection God promises doesn’t mean that we won’t struggle. But the perfection God promises means that when we lay our heads on the pillow each night we can be satisfied that in His eyes we are already perfect. And that’s a peace we all can use at the end of another long day. What are you willing to do for God? Many of us would be quick to say we would do anything. We would serve the hungry, help build homes for the homeless and perhaps even travel to the ends of the earth. But how much are we truly willing to give up? Abraham was a man who loved God with all his heart and was given the promise that he would father many nations. Abraham was faithful throughout his life, but still had to wait 100 years for the promise of a son to be fulfilled. We can only guess at Abraham’s elation and joy at the birth of his son. The love and pride he felt must have made him want to burst, and I imagine he immediately began making plans for who he hoped his son would become. As Isaac grew Abraham soon learned that his time of trusting was not over. Then God said, `Take your son, your only son Isaac, whom you love, and go to the region of Moriah. Sacrifice him there as a burnt offering on one of the mountains I will tell you about. God asked Abraham to sacrifice his only son – to give up the fulfillment of his promise in order to prove his love for the Lord. I can’t count the number of times I’ve asked myself why God would ask something so unthinkable of a man who was so faithful to Him. It is often difficult to understand why the Lord requires from us things that we don’t understand, even things that seem downright cruel. Abraham and Isaac’s story has a happy ending. God provided a ram for the sacrifice, and Isaac lived to tell of God’s provision. Is it the desire for my dream job? To grow old with a Godly man who loves me almost as much as he loves the Lord? What is He asking you to lay down for Him? No matter what God calls us to sacrifice, we must be willing to give it up; to lay it down on the altar in front of my Lord and slay it…proclaiming that even our most precious possessions on earth or our strongest desire is not stronger than our love for God and the choice to obey Him regardless of the cost. This promise came generations after Abraham’s faithfulness, but I believe is still true for us today. When we delight ourselves in Him our desires will align with God’s and we will be blessed by them. We may find our desires remain the same as they have been for years or they may change. But we can cling to God’s promises and know that our faithfulness and sacrifice will be rewarded. No matter what the outcome we must focus on God and our faithfulness to Him, not on the reward waiting for us some day. This promise gives me peace in the puzzle of life. I hope you find that peace today as well. This Monday morning on my drive to work my mind was all over the place. I wondered where the school bus was that’s usually in front of me, anticipated what was in store for me at work and questioned whether or not I could finish mowing the lawn when I got home. Somewhat distracted, I rounded a curve and gasped in awe! 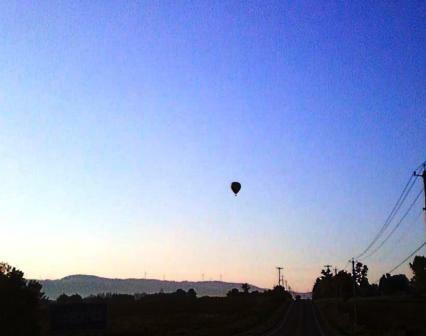 Suspended above me was a hot air balloon, gracefully gliding in the sky. Turning my head to the left I was awe-struck again by two more balloons, one on its way down. I was thrilled! 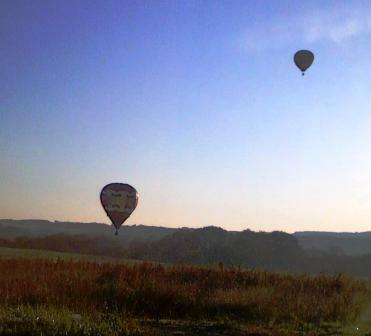 As I glanced to my right, two more balloons appeared! I could hardly believe my eyes. What a wonderful beginning to my morning! The thoughts in my head changed from the worries and cares of the day ahead to rejoicing and thanking God for this special “lift” on a Monday morning. I began to concentrate on praising the Lord for my blessings and praying for friends, family and even strangers and what they were facing in life. Truly a weight was lifted and my heart began to float like the balloons I left behind. As my car began its ascent into the hills where I work I was suddenly filled with wonder. Over the weekend God had used His paintbrush on the trees all around me. As the sun danced on the leaves I was at a loss for words. I attempted to cry out to God in thanks for the beauty around me, but was truly awestruck at the wonder of His glorious creation and the fact that He put it all there for ME! On days like Monday it is easy to worship God. But some days it’s not. Some days I’m hurried, harried, or just going through the motions of life. I see no awe or wonder when life feels monotonous and I’m struggling to get through the day, physically, mentally or emotionally. It’s not that the awe and wonder aren’t there. It’s just that I’m too self-centered to look around me and see it. I agree with Francis that this is the key. I am committing to swim against the tide of apathy and ordinary and wake up to the wonder around me. I have promised God that I will be more intentional in looking for areas of awe and wonder. Every day is filled with awe…we just need to allow ourselves to see it. Wonder is all around us. I wonder why we so often miss it. Peace in my life’s puzzle includes finding awe and wonder in each day, and remembering to give credit to the God who created it. I wonder if you’ll look closer too.